Without the right gear, hiking can be absolutely miserable. Whether you’re traipsing around alpine areas or trekking through desert sand dunes, the outdoors be unpredictable and it’s best to come prepared for anything. 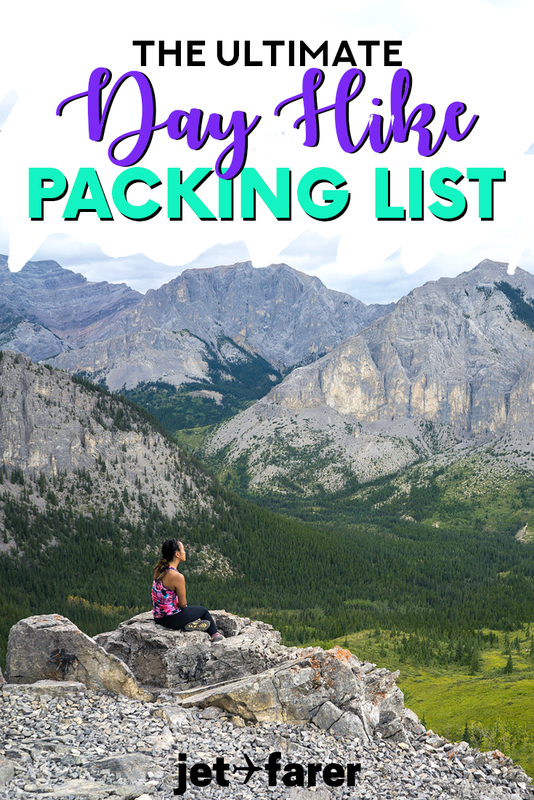 Don’t leave your safety and comfort up to chance: we’ve created this day hiking packing list below to make sure you’ve covered all of your bases. 15 items?! Why pack all of this stuff for a day hike? Because, on the trails, you never know what can happen. During a good hike, you might just get caught in a short rain storm. However, there’s always a possibility of getting stuck in a cave, stranded by a landslide, or simply lost in the woods. By packing enough essentials and emergency materials, you’ll set yourself up to be able to survive in case of any unexpected conditions. 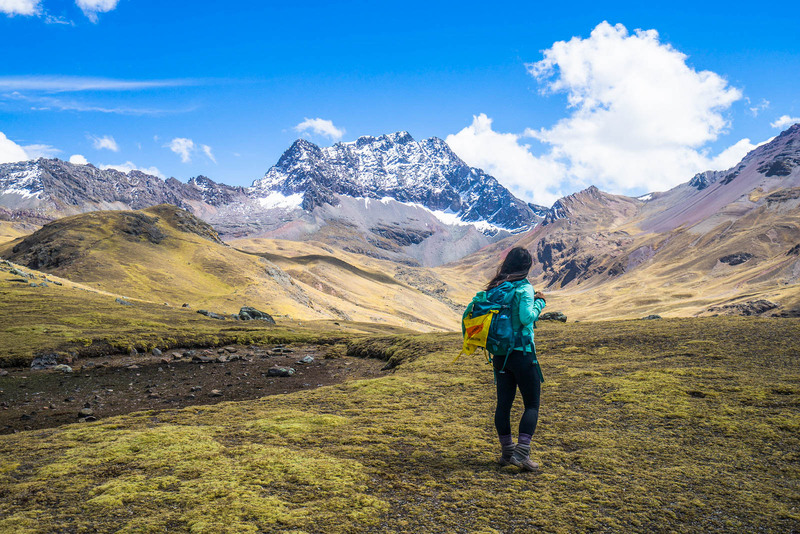 Hiking will often take you through a variety of different terrains, so it’s important to have a backpack that’s going to support you rather than weigh you down. A sturdy day pack is a MUST for any day hike, unless you’re Superman and can simply fly back to town whenever you need something. I am NOT a light packer when I hike. Usually, at a minimum, I’m carrying my big Hydro Flask bottle, my camera equipment, my tripod, a few extra clothing layers, my other hiking gear, and lots of snacks. Therefore, I need a backpack that has plenty of space, and also has sturdy support for my back and shoulders. The Osprey Nova day pack gives me all of that and more – it doubles as a wonderful carry-on backpack for flights as well. Not only do you want your boots to be comfortable, but you’ll probably want waterproofing as well. For any kind of hiking excursion, I highly recommend the Ahnu Montara hiking boots (or, for men, the Ahnu Coburn hiking boots). These feel like clouds on my feet, but are also extremely durable, waterproof, and supportive for walking on any kind of terrain. This one is self-explanatory, but you’ll probably want to bring a comfy pair of hiking socks on any adventure. For longer hikes, make sure you choose a pair that’s extra thick for added comfort on your tired feet. If you’re planning on passing through streams or lakes, bring an extra pair. I’m convinced there’s no such thing as too many pairs of socks! Please don’t be one of those people who hikes with disposable plastic bottles. Do yourself and your environment a favor and use a durable, reusable water bottle instead of single-use plastics. There are loads of different kinds of water bottles out there, but for long day hikes, I always bring my trusty Hydro Flask. It’s solid as a rock and keeps my water cold all day. There are all kinds of nasty bacteria, viruses, and parasites lurking in stream water that, if ingested, can make you very sick. If you’re planning on filling up your water bottle along the trails, bring a purification system to make sure you prevent any water-borne illnesses from entering your system. Some types of filters are better at removing certain kinds of bugs than others, so be sure to do your research and use more than one system to ensure your water is completely safe to drink. When I hike, I use a combination of a water filter and a UV purifier. They seem to have worked so far! There are few things more terrifying than a hangry hiker. If you don’t believe me, just wait until you stumble upon one yourself. If you’re worried about becoming a hangry hiker, make sure you bring lots of snacks and provisions to last you the majority of the day. Some hiker favorites include Clif bars, trail mix, jerky, PB&J sandwiches, and all kinds of fruit (dried and whole). In case of emergencies, you never want to be without some kind of power. A solar-powered rechargeable battery pack can help with this. Just hang it on the back of your backpack while hiking and it will recharge automatically. Then, if you need to recharge your phone, GPS, camera, or something else, you can do so on the trails. Sometimes, the best times to hike are in the early morning and late in the afternoon. Those mountain sunrises/sunsets are calling! However, if you plan to hike in non-optimal daylight, it’s critical to bring a head lamp with you. Head lamps make it easy for you to navigate around in the dark without needing to hold on to something extra. Flashlights are so yesterday. I recommend bringing a head lamp on every hike in case of emergencies, as you never know whether you might get lost, face severe weather conditions, or otherwise need to set up camp somewhere unexpectedly. It might seem strange to bring a knife and fire gear on a day hike. You’re only going for a few hours, right? Well, it’s incredibly important to have a hiking/camping knife with you to cut small pieces of firewood or remove dangerous plants or branches as needed. Fire starting gear is the same thing: there are situations in which starting your own fire may be absolutely critical. I’ll be honest, I haven’t brought fire starting gear on all of my hikes in the past. However, I’m going to start, because it’s incredibly important to make sure you can start a fire if you get lost or stranded. With fires, you can keep warm, cook food, and help alert others to your whereabouts. Just make sure you don’t attempt to bring these items on the plane with you! If you’re outdoors for more than a few minutes, you should definitely make sure you’ve got a good pair of sunglasses. However, not all sunglasses are created equal. You can best protect your eyes by thoroughly researching each pair of sunglasses, ensuring they have adequate UV protection, and making sure they’re polarized. For hiking, you may want to purchase a lanyard as well to make sure your sunglasses don’t fall or get lost. Sun protection for your skin is just as important as sun protection for your eyes. On any hike, you should have adequate amounts of sweat-resistant sunscreen and reapply it regularly. If you’re going to be swimming in the ocean or nearby, I recommend using some reef-safe sunscreen to help protect marine wildlife. Some UV protecting lip balm is also a good idea. To protect your face, you should also use a sweat-resistant brimmed hat (preferably with a drawstring, so that it doesn’t fly away in the wind). No one likes bug bites. They’re itchy, unsightly, and a nuisance. But more importantly, some kinds of bug bites can cause horrible diseases (like malaria or Lyme disease) and long-term bodily damage. Therefore, it’s critical to protect yourself from mosquitoes, ticks, and spider bites as much as possible. When hiking any distance, be sure to bring bug spray with DEET for maximum protection. If you do end up getting stranded overnight (or even during the day), an emergency blanket is a must. It will help to keep you warm and dry, and provide a small bit of shelter from the elements. Sure, you probably won’t use it 99% of the time, but it’s a good idea to carry one with you in case the unexpected happens. There’s no need to bring a bulky, unwieldy first aid kit on your day hikes. However, you should have a small, basic kit on all of your hikes. I find it easiest to buy a pre-assembled first aid kit, which includes a small bag to hold everything. What to Pack for a Camping Trip – If you’re planning on camping during your hiking excursion, read this. 12 Items to Help You Travel More Sustainably – Want to reduce your single-use waste forever? Pick up some of these snazzy items to help. Have more questions about camping? Ask away in our Jetfarer Facebook group.